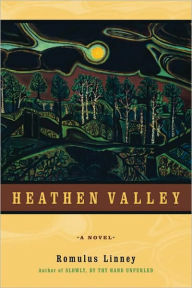 Heathen Valley, Romulus Linney’s haunting and original novel, was born from the church histories of the Valle Crucis mission in western North Carolina. Told in four parts, it is a story set in an almost unknown valley, “Heathen, a valley That Forgot God.” With a quiet, muscular violence and biblical grace that readers of Cormac McCarthy will recognize, Linney takes us into the 1850s, where an idealistic Bishop from New England and a life-whipped, sorrowful transient named Starns, struggle to win souls and transform the valley. Widely reviewed when it was first published in 1962 and selected as an alternate for the Book of the Month Club, Romulus Linney’s first novel Heathen Valley was never reprinted and has never before been in paperback. ROMULUS LINNEY, acclaimed playwright of over 30 plays, including Childe Byron, “2”, and Holy Ghosts, is the author of two other novels, Jesus Tales and Slowly, By Thy Hand Unfurled. Linney has received numerous awards, including two National Critics Awards for Best Play of the Year, and two Obie Awards. He is a member of the American Academy of Arts and Letters, which gave him its Award in Literature and its Award of Merit Medal for Drama.